Oh man, I couldn’t wait to share this recipe with you! Since I discovered it from my good friend, Casey, I have already made it twice. The first time I made it was for my mom’s group, called MOPS. I wasn’t sure how it would go over, but apparently they liked it so much that it was all gone. Josh didn’t even have a chance to try them, so I figured I owed it to him to make another batch. You can play around with the nuts and the type of chocolate you use. 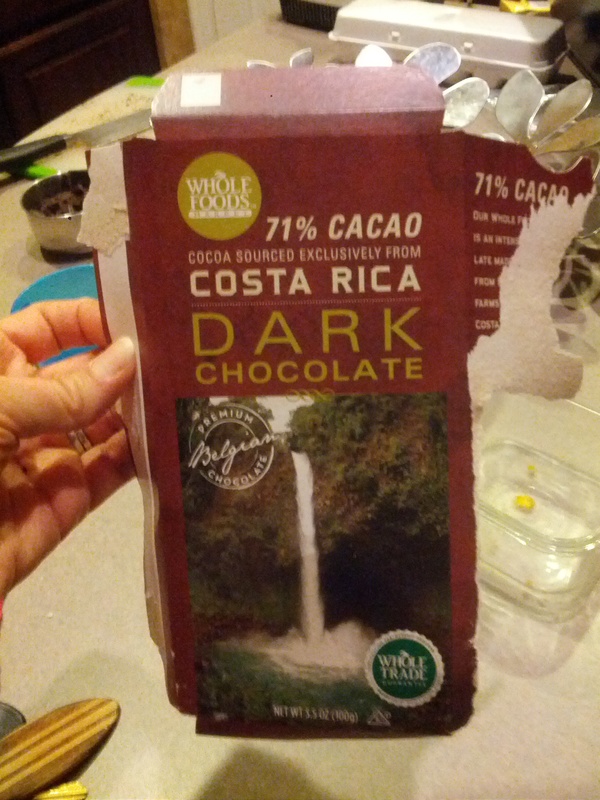 The first time I made them, I used this dark chocolate from Whole Foods, and the second time, I used the good ‘ole Enjoy Life dairy free chocolate chips. As for the nuts, her recipe calls for almonds but I used cashews since that’s what I had-I was pleasantly surprised (even though cashews are my favorite nut). Do check out her blog to see her step by step pictures to make sure you are doing it correctly. Now on to the deliciousness! 1. If you don’t already have ground almonds, place plain almonds in a food processor and process until you have ground almonds. Be sure not to process too much or you’ll end up with almond flour or butter. 2. Place ground almonds, unsweetened shredded coconut, tahini, salt and cacao nibs in food processor. Pulse approximately 10 seconds. 3. Carefully heat coconut oil in a sauce pan (not the microwave! ), being careful not to burn. 4. Add honey and vanilla to coconut oil and mix well. 5. Add mixture in sauce pan to nut mixture in food processor and process until creamy. 6. Pour into an 8×8 pan. You can line with parchment paper or plastic wrap to make removal easier if you’d like. 7. Place in refrigerator for 30 minutes. 8. 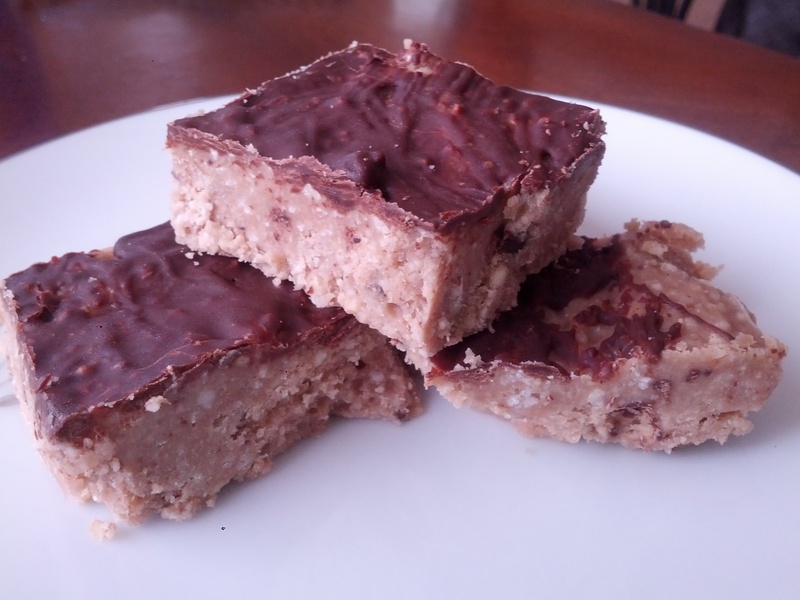 Remove from refrigerator and slice into 16 squares. Optional: Melt 1 oz of dark chocolate in a sauce pan. Remove refrigerated cookie dough and drizzle melted chocolate over the top. Return to refrigerator for 30 minutes. If you don’t have any chocolate, don’t let that stop you from making these. They’re plenty sweet without it. More options: Try almond butter or sunflower butter in place of tahini, or walnuts in place of almonds. Use what you like or what you have on hand and change it up until you find your favorite combination.